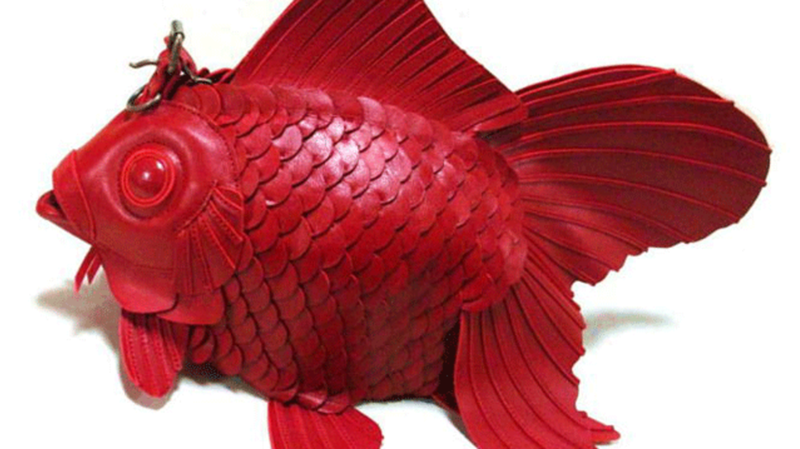 These handcrafted leather accessories make for a low-maintenance and stylish alternative to having a goldfish as pet. According to Rocket News 24, each goldfish-shaped purse is handcrafted by the Japanese company Atelier Iwakiri. The smooth leather scales are sewn on "one by one," resulting in a product so lifelike it looks like it could swim away at any moment. The bag measures about 18 inches from lips to tail and is accented with antique gold features. Because each goldfish purse is made to order by hand, delivery time can take anywhere from two weeks to six months. The level of craftsmanship is also reflected in the price: bags can cost as much as $1100. The purses are available in red, black, brown, and dark brown, and can be purchased by contacting Atelier Iwakiri via their email form. Images Courtesy of Atelier Iwakiri.